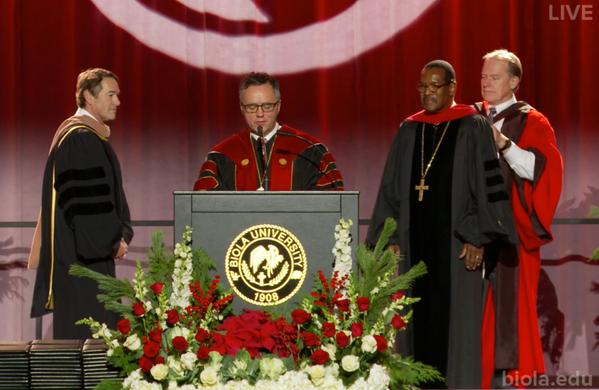 On December 18, 2015, Bishop Charles E. Blake was awarded an honorary doctorate of divinity degree by Biola University. Influential Los Angeles pastor Bishop Charles E. Blake, Sr. will give Biola University’s 2015 fall commencement address at the undergraduate and graduate ceremonies on Dec. 19. In addition, Blake will receive an honorary Doctorate of Divinity degree from Biola for his extensive work as a pastor demonstrating an unwavering commitment in obedience to the Word of God. Blake is the pastor of West Angeles Church of God in Christ in Los Angeles, Calif. — one of the country’s largest megachurches with more than 25,000 members. He is the presiding bishop of the entire Church of God in Christ denomination, which boasts nearly 6.5 million members from more than 60 countries worldwide. West Angeles Church of God in Christ is sometimes called “the church to the stars” due to its geographical location and attendees like Denzel Washington, Stevie Wonder, and Samuel and LaTanya Jackson. Described as a “man of great integrity” by Washington, Blake humbly uses his platform to give back to the local and international community. West Angeles has established more than 400 housing and commercial properties for the inner city of Los Angeles and Blake has assisted thousands of Los Angeles County residents by implementing various educational, financial and social programs. Furthermore, Blake founded and is president of the Pan African Children’s Fund (PACF) organization. “Save Africa’s Children,” a program within PACF, supports more than 420 orphan care programs, 200,000 children and 24 nations throughout sub-Saharan Africa.